Tharisa has acquired a 90% shareholding in Salene Chrome Zimbabwe (Pvt) Limited at the par value thereof from the Leto Settlement Trust, a related party being the beneficial shareholder of Medway Developments Limited, a material shareholder in Tharisa. The effective date of the acquisition is 15 May 2018. Leto will retain a 10% free carried shareholding in Salene and be entitled to a 3% royalty on the gross proceeds from the sale of the chrome concentrates produced. Salene has been awarded three special grants under the Zimbabwe Mines and Minerals Act covering an area of approximately 9 500 hectares (95 km2) on the eastern side of the Great Dyke in Zimbabwe, which entitles it to mine the minerals thereon including illuvial chrome, being at surface chrome fines generated from seams as a result of weathering. A special grant is issued in terms of Chapter XIX of the Zimbabwe Mines and Minerals Act and authorises the holder thereof to carry out mining operations for a specified mineral or minerals (including chrome in this instance), over the specified area for a period of 24 months, with the right of annual renewal on the expiry of such period on 90 days prior application. Salene intends applying for the consolidation of the special grant areas into a mining lease area valid for the life of mine. Salene is applying to the Zimbabwean government for National Project Status and for the special grant areas to be contained within a proposed Special Economic Zone. provides Tharisa with a low-cost entry into a promising growth project in a new mineral rich geography. While it is understood that certain geological exploration work has been undertaken on the special grant areas to date, there is insufficient information available to be able to accurately quantify the value of the net assets (being the special grants) or the profits attributable thereto, can be determined or quantified at this stage. Salene will, on obtaining the necessary environmental permits, embark on a trenching programme over the special grant areas in order to determine the extent of the mineralisation and the sampling thereof to determine the in situ grade of the chrome content. The budgeted cost for the geological test work to be spent over a twelve-month period is $3.2 million. Based on the results of the geological test work, Salene will construct a pilot plant to treat the illuvial chrome deposits. This is in order to optimise the plant design to maximise recoverability, form the basis for preparing the required process flow and quantify the capital estimates in relation to a production scale plant. The nature of the special grant areas allows for a project that is a scalable open pit operation that can be brought into production on a low risk and relatively low cost basis in a short time horizon. Arxo Resources Limited (?Arxo? ), the wholly owned trading subsidiary of Tharisa, will be the sole off-taker/marketing agent for the chrome concentrates produced, thereby leveraging Arxo?s existing capabilities. The Great Dyke of Zimbabwe contains the world's largest known platinum group metals and high grade chrome deposits outside of South Africa. The Great Dyke region is known to contain illuvial chrome concentrations of up to 30% Cr2O3 at surface. With this geographical diversification into Zimbabwe, Tharisa has appointed Josephat Zimba to Country Manager, Zimbabwe. Dr Zimba is a key member of the New Business Development team and has been at the forefront of this Zimbabwean diversification initiative. He joined the Tharisa Group as the Group Chief Scientist in June 2009 as a key member of the Group?s strategic R&D team. 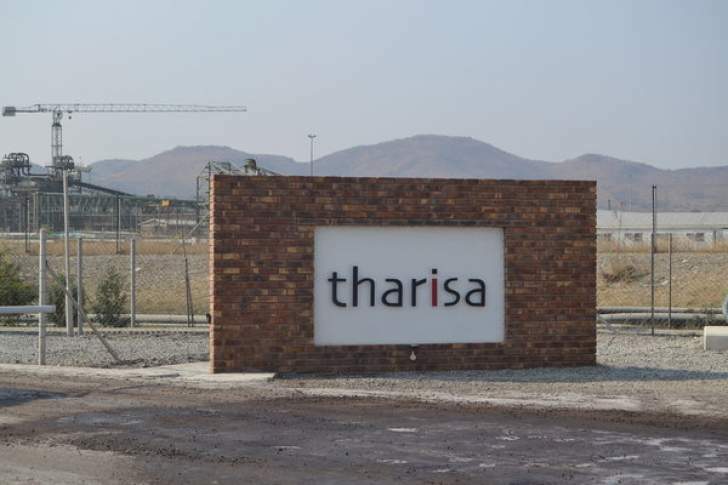 Hans van Wyk, the Operations Director at Tharisa Minerals, has been appointed Chief Technical Officer for the Tharisa Group to further strengthen the technical executive management as Tharisa implements its diversification strategy. He is welcomed as a member of the Executive Management. Mr van Wyk commenced at Tharisa Minerals as a consulting metallurgist in September 2011. He was promoted to Operations Director in 2016. Mr van Wyk will continue to have responsibility for the overall management of all processing, smelting and beneficiation operations at the Tharisa Mine. Mr van Wyk has over 17 years? experience in the recovery of chrome and PGMs, having worked on a number of chrome and PGM concentrator operations throughout his career. This transaction is subject to compliance by Tharisa with the Listings Requirements of the JSE Limited as they pertain to related party transactions.